Bioplastics are often touted as being eco-friendly, but do they live up to the hype? The world has produced over nine billion tons of plastic since the 1950s. 165 million tons of it have trashed our ocean, with almost 9 million more tons entering the oceans each year. Since only about 9 percent of plastic gets recycled, much of the rest pollutes the environment or sits in landfills, where it can take up to 500 years to decompose while leaching toxic chemicals into the ground. Traditional plastic is made from petroleum-based raw materials. Some say bioplastics—made from 20 percent or more of renewable materials—could be the solution to plastic pollution. The often-cited advantages of bioplastic are reduced use of fossil fuel resources, a smaller carbon footprint, and faster decomposition. Bioplastic is also less toxic and does not contain bisphenol A (BPA), a hormone disrupter that is often found in traditional plastics. 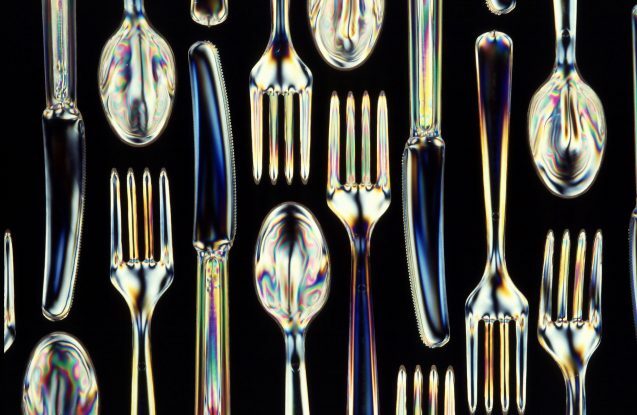 However, it turns out that bioplastics are not yet the silver bullet to our plastic problem. Since there is often confusion when talking about bioplastics, let’s clarify some terms first. Degradable – All plastic is degradable, even traditional plastic, but just because it can be broken down into tiny fragments or powder does not mean the materials will ever return to nature. Some additives to traditional plastics make them degrade more quickly. Photodegradable plastic breaks down more readily in sunlight; oxo-degradable plastic disintegrates more quickly when exposed to heat and light. Biodegradable – Biodegradable plastic can be broken down completely into water, carbon dioxide and compost by microorganisms under the right conditions. “Biodegradable” implies that the decomposition happens in weeks to months. Bioplastics that don’t biodegrade that quickly are called “durable,” and some bioplastics made from biomass that cannot easily be broken down by microorganisms are considered non-biodegradable. 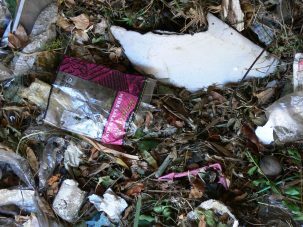 Compostable – Compostable plastic will biodegrade in a compost site. Microorganisms break it down into carbon dioxide, water, inorganic compounds and biomass at the same rate as other organic materials in the compost pile, leaving no toxic residue. Bioplastics are currently used in disposable items like packaging, containers, straws, bags and bottles, and in non-disposable carpet, plastic piping, phone casings, 3D printing, car insulation and medical implants. The global bioplastic market is projected to grow from $17 billion this year to almost $44 billion in 2022. There are two main types of bioplastics. PLA (polyactic acid) is typically made from the sugars in corn starch, cassava or sugarcane. 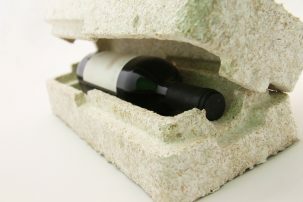 It is biodegradable, carbon-neutral and edible. To transform corn into plastic, corn kernels are immersed in sulfur dioxide and hot water, where its components break down into starch, protein, and fiber. The kernels are then ground and the corn oil is separated from the starch. The starch is comprised of long chains of carbon molecules, similar to the carbon chains in plastic from fossil fuels. Some citric acids are mixed in to form a long-chain polymer (a large molecule consisting of repeating smaller units) that is the building block for plastic. PLA can look and behave like polyethylene (used in plastic films, packing and bottles), polystyrene (Styrofoam and plastic cutlery) or polypropylene (packaging, auto parts, textiles). Minnesota-based NatureWorks is one of the largest companies producing PLA under the brand name Ingeo. 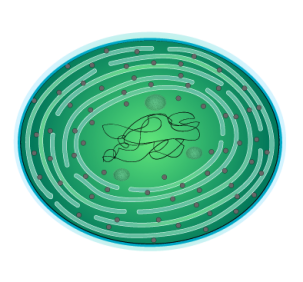 PHA (polyhydroxyalkanoate) is made by microorganisms, sometimes genetically engineered, that produce plastic from organic materials. The microbes are deprived of nutrients like nitrogen, oxygen and phosphorus, but given high levels of carbon. They produce PHA as carbon reserves, which they store in granules until they have more of the other nutrients they need to grow and reproduce. 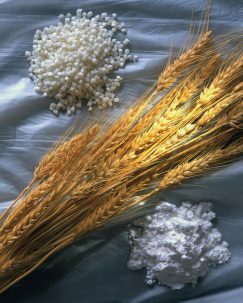 Companies can then harvest the microbe-made PHA, which has a chemical structure similar to that of traditional plastics. Because it is biodegradable and will not harm living tissue, PHA is often used for medical applications such as sutures, slings, bone plates and skin substitutes; it is also used for single-use food packaging. While bioplastics are generally considered to be more eco-friendly than traditional plastics, a 2010 study from the University of Pittsburgh found that wasn’t necessarily true when the materials’ life cycles were taken into consideration. The study compared seven traditional plastics, four bioplastics and one made from both fossil fuel and renewable sources. The researchers determined that bioplastics production resulted in greater amounts of pollutants, due to the fertilizers and pesticides used in growing the crops and the chemical processing needed to turn organic material into plastic. The bioplastics also contributed more to ozone depletion than the traditional plastics, and required extensive land use. B-PET, the hybrid plastic, was found to have the highest potential for toxic effects on ecosystems and the most carcinogens, and scored the worst in the life cycle analysis because it combined the negative impacts of both agriculture and chemical processing. Bioplastics do produce significantly fewer greenhouse gas emissions than traditional plastics over their lifetime. There is no net increase in carbon dioxide when they break down because the plants that bioplastics are made from absorbed that same amount of carbon dioxide as they grew. A 2017 study determined that switching from traditional plastic to corn-based PLA would cut U.S. greenhouse gas emissions by 25 percent. 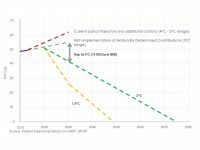 The study also concluded that if traditional plastics were produced using renewable energy sources, greenhouse gas emissions could be reduced 50 to 75 percent; however, bioplastics that might in the future be produced with renewable energy showed the most promise for substantially reducing greenhouse gas emissions. While the biodegradability of bioplastics is an advantage, most need high temperature industrial composting facilities to break down and very few cities have the infrastructure needed to deal with them. As a result, bioplastics often end up in landfills where, deprived of oxygen, they may release methane, a greenhouse gas 23 times more potent than carbon dioxide. When bioplastics are not discarded properly, they can contaminate batches of recycled plastic and harm recycling infrastructure. 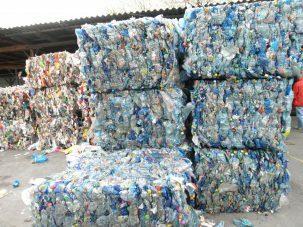 If bioplastic contaminates recycled PET (polyethylene terephthalate, the most common plastic, used for water and soda bottles), for example, the entire lot could be rejected and end up in a landfill. So separate recycling streams are necessary to be able to properly discard bioplastics. The land required for bioplastics competes with food production because the crops that produce bioplastics can also be used to feed people. The Plastic Pollution Coalition projects that to meet the growing global demand for bioplastics, more than 3.4 million acres of land—an area larger than Belgium, the Netherlands and Denmark combined—will be needed to grow the crops by 2019. In addition, the petroleum used to run the farm machinery produces greenhouse gas emissions. Bioplastics are also relatively expensive; PLA can be 20 to 50 percent more costly than comparable materials because of the complex process used to convert corn or sugarcane into the building blocks for PLA. However, prices are coming down as researchers and companies develop more efficient and eco-friendly strategies for producing bioplastics. 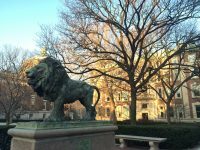 Kartik Chandran and Columbia students are developing systems to produce biodegradable bioplastic from wastewater and solid waste. Chandran uses a mixed microbe community that feeds on carbon in the form of volatile fatty acids, such as acetic acid found in vinegar. His system works by feeding wastewater into a bioreactor. Inside, microorganisms (distinct from the plastic-producing bacteria) convert the waste’s organic carbon into volatile fatty acids. The outflow is then sent to a second bioreactor where the plastic-producing microbes feed on the volatile fatty acids. These microbes are continually subjected to feast phases followed by famine phases, during which they store the carbon molecules as PHA. Chandran is experimenting with more concentrated waste streams, such as food waste and solid human waste, to produce the volatile fatty acids more efficiently. The focus of his research is to both maximize PHA production and to integrate waste into the process. “We want to squeeze as much as we can [out of both systems],” said Chandran. He believes his integrated system would be more cost-effective than the methods currently used to produce bioplastic that involve buying sugars to make PHA. “If you integrate wastewater treatment or address food waste challenges with bioplastic production, then this is quite favorable [economically],” said Chandran. “Because if we were to scale up and go into commercial mode, we would get paid to take the food waste away and then we would get paid to make bioplastics as well.” Chandran hopes to close the loop so that, one day, waste products will routinely serve as a resource that can be converted into useful products like bioplastic. Full Cycle Bioplastics in California is also producing PHA from organic waste such as food waste, crop residue such as stalks and inedible leaves, garden waste, and unrecycled paper or cardboard. Used to make bags, containers, cutlery, water and shampoo bottles, this bioplastic is compostable, marine degradable (meaning that if it ends up in the ocean, it can serve as fish or bacteria food) and has no toxic effects. Full Cycle can process the PHA at the end of its life, and use it to make virgin plastic again. Pennsylvania-based Renmatix is utilizing woody biomass, energy grasses and crop residue instead of costlier food crops. Its technology separates sugars from the biomass using water and heat instead of acids, solvents or enzymes in a comparatively clean, quick and inexpensive process. Both the sugars and the lignin from the biomass are then used as building blocks for bioplastics and other bioproducts. At Michigan State University, scientists are trying to cut production costs for bioplastic through the use of cyanobacteria, also known as blue-green algae, that use sunlight to produce chemical compounds through photosynthesis. Instead of feeding their plastic-producing bacteria sugars from corn or sugarcane, these scientists tweaked cyanos to constantly excrete the sugar that they naturally produce. The plastic-producing bacteria then consume the sugar produced by the cyanos, which are reusable. Stanford University researchers and California-based startup Mango Materials are transforming methane gas from wastewater treatment plants or landfills into bioplastic. The methane is fed to plastic-producing bacteria that transform it into PHA, which the company sells to plastic producers. It is used for plastic caps, shampoo bottles or biopolyester fibers that can be combined with natural materials for clothing. The bioplastic will biodegrade back into methane, and if it reaches the ocean, can be digested naturally by marine microorganisms. 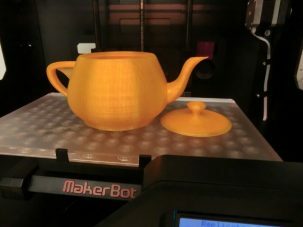 The Centre for Sustainable Technologies at the University of Bath in England is making polycarbonate from sugars and carbon dioxide for use in bottles, lenses and coatings for phones and DVDs. Traditional polycarbonate plastic is made using BPA (banned from use in baby bottles) and the toxic chemical phosgene. The Bath researchers have found a cheaper and safer way to do it by adding carbon dioxide to the sugars at room temperature. Soil bacteria can break the bioplastic down into carbon dioxide and sugar. And then there are those developing innovative ways to replace plastic altogether. Japanese design company AMAM is producing packaging materials made from the agar in red marine algae. The U.S. Department of Agriculture is developing a biodegradable and edible film from the milk protein casein to wrap food in; it is 500 times better at keeping food fresh than traditional plastic film. And New York-based Ecovative is using mycelium, the vegetative branching part of a fungus, to make Mushroom Materials, for biodegradable packaging material, tiles, planters and more. Right now, it’s hard to claim that bioplastics are more environmentally friendly than traditional plastics when all aspects of their life cycle are considered: land use, pesticides and herbicides, energy consumption, water use, greenhouse gas and methane emissions, biodegradability, recyclability and more. But as researchers around the world work to develop greener varieties and more efficient production processes, bioplastics do hold promise to help lessen plastic pollution and reduce our carbon footprint. This is not a report, it’s a blog post about previous research in this field of study. It is paid for by the Earth Institute at Columbia University. Very good article. Here in the Netherlands plastics is a major social issue so companies are looking for alternatives. There is a company here called Vibers which is able to make plastic from elephant grass.